Åström, Patrik. Tendensen i Kristoffers landslag. (The Tendency in Kristoffers landslag.) Uppsala 2016. Samlingar utgivna av Svenska fornskriftsällskapet, Serie 1, Svenska skrifter 100. 168 pp. ISBN 978-91-979881-4-8. Just before Christopher of Bavaria took office as king of Sweden in 1442 a revision was made of the Common Law (”Magnus Erikssons landslag”). 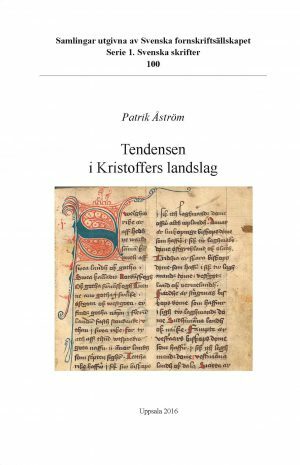 This revision, later called ”Kristoffers landslag”, had a very limited distribution, judging from the number of surviving manuscripts. The reason for the limited distribution, it has been claimed, was that Kristoffer’s successor, Karl Knutsson Bonde, did not dare to promote the new law, since it had an aristocratic tendency opposed by the common peasantry. The main questions asked here are: 1) What do we actually know about the distribution of the new legislation? 2) Is there an aristocratic influence in the new law, and if not, can we see any other tendency? In the first section of this work the historical background is outlined. The second sec- tion examines how legislative rules were disseminated in Sweden during the late Mid- dle Ages. It is stated that it is difficult to achieve absolute certainty about how widely spread new rules were, since they were reproduced not only in written form (laws and statutes), but also orally, either by reading or from memory. In the third section it is shown that there are no signs of Karl Knutsson abolishing the new law, and, fur- thermore, that there are no unambiguous signs of an aristocratic tendency in the new revision. The fourth section, finally, attempts to trace any influence at all, and comes to the conclusion that there is at least some evidence of an influence from the church, in particular its political ideology and canonical law. Among the appendices, a late medi- eval compilation of some differences between the new and old law is most noteworthy. Keywords: legal history, medieval common law, law distribution, medieval literacy, canon law.